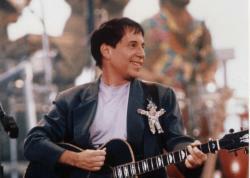 Paul Simon performs on the Great Lawn on August 15, 1991, before one of the largest crowds ever assembled in New York’s Central Park. Celebrate the legendary artist as he performs a retrospective mix of favorites before an enormous crowd in Central Park in 1991. Joining Paul Simon onstage are a 17-piece band, South African and Brazilian musicians, Chevy Chase and a Bahian drum ensemble. Paul Simon's Concert in the Park airs Sunday, November 25, 2018 at 8:00 p.m. on WXXI-TV. The 17-piece band — assembled from three countries — included New York session musicians (alert viewers may be able to spot jazz trumpeter Chris Botti among them) and the South African and Brazilian musicians who had played with him on his solo work. Ten drummers from the Bahian drum ensemble Grupo Cultural Olodum also joined in, making the evening an exhilarating musical and cultural event. Simon was also joined on stage by Chevy Chase in a rousing rendition of “You Can Call Me Al,” made memorable by their “dueling saxophones” and dance moves from the video they had made to accompany the release of the record.